Welcome to a quick MHM-but-not-on-a-Monday post, introducing and explaining my brand new Question Box. It's nothing too fancy but I'm really hoping that it'll be successful as it will really help me to tailor future posts to make sure I'm chatting about stuff everyone's interested in. 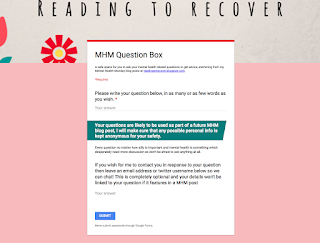 The aim of this Question Box is to give anyone who reads a Mental Health Mondays post the chance to feedback and get a bit of advice or have a question answered which they're too scared to ask publicly. ... and the idea is you put in your question and depending on whether or not you leave contact details for me either you'll hear from me or your question will pop up in a future MHM Q&A session which I'm hoping to introduce on a semi-regular basis. In order for any of this to work however I need you my readers and chums to be bold and just put yo' questions in that box! It can be any question on any mental health related topic, based on your experience, on something you've seen or something I've written - basically whatever you want because it's all important! By no means am I trying to say that I have all the answers and there are some areas I won't have enough experience of answer myself but I'm willing to try and find others who can help if possible. My aim really is just to emphasise how important it is that we discuss all MH related things and help to destroy peoples' misconceptions. So this is my shiny new Question Box, please take time to have a think about whether there's anything you'd like to submit as a question and click here to submit it! I'm nervous about posting this as I'm not sure how successful it will be but I'm hoping that I'll get at least a couple of questions as anything will help me know what to post about in the future!